IRVING, TEXAS--(BUSINESS WIRE)--For almost a decade, beloved TV personalities, entrepreneurs, and design and real estate experts Drew and Jonathan Scott have created memorable home designs for clients both onscreen and off. Now, in collaboration with The Michaels Companies, Inc. (NASDAQ: MIK), North America’s largest arts and crafts specialty retailer, the Scott brothers are launching their first-ever Scott Living custom frame program, designed to help customers showcase their mementos, masterpieces – and anything else they can dream up – in signature style. Though the Scott Living custom frame program debuts in Michaels stores across the United States and Canada in early March, the retailer has been the long-time preferred destination for professional, high quality framing. As the largest custom framer in North America, Michaels has built more than 20 million unique custom frames, from artwork and family photos to sentimental keepsakes. 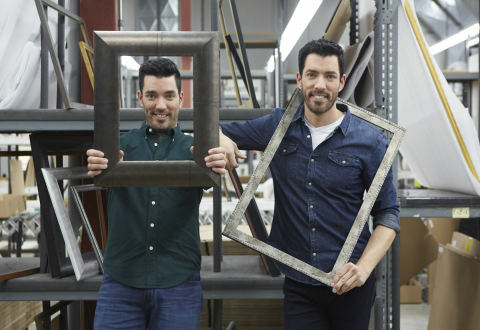 “We are thrilled to expand our assortment of custom frames to include designs from Jonathan and Drew Scott. The Scott Living custom frames have everything from meticulous detailing to quality finishes, making the program so versatile anyone can find a piece to complement their space beautifully,” said Steve Carlotti, Michaels EVP of Marketing. The brothers collaborated on the designs, drawing on their personal aesthetics and pulling inspiration from rich natural materials. The result is a range of nearly four dozen stunning options, spotlighting unique wood grain, shagreen and pebbled textures, refined stone, and satiny slate. Many of the finishes are paired with metallic accents that range from bold solids to seemingly-hand painted accents in gold, silver, bronze and copper tones, and more. To find more information on the Scott Living custom framing program, along with other design inspiration to get you in the right frame of mind, please visit www.michaels.com. A Fortune 500® Company, The Michaels Companies, Inc. is North America's largest specialty provider of arts, crafts, framing, floral, wall décor, and seasonal merchandise for Makers and do-it-yourself home decorators. As of October 28, 2017, the Company owned and operated 1,371 stores in 49 states and Canada under the brands Michaels, Aaron Brothers and Pat Catan's. The Michaels Companies, Inc., also owns Artistree, a manufacturer of high quality custom and specialty framing merchandise, and Darice, a premier wholesale distributor in the craft, gift and decor industry. The Michaels Companies, Inc. produces a number of private brands including Recollections®, Studio Decor®, Bead Landing®, Creatology®, Ashland®, Celebrate It®, ArtMinds®, Artist's Loft®, Craft Smart®, Loops & Threads®, Make Market®, Foamies®, LockerLookz®, Imagin8®, and Sticky Sticks®. Learn more about Michaels at www.michaels.com. Multi-faceted entrepreneurs, authors and twin television personalities, Jonathan and Drew Scott are co-founders of Scott Brothers Global, which includes Scott Living and Scott Brothers Entertainment. Scott Living is Jonathan and Drew’s rapidly expanding collection of home goods, which includes indoor furniture, décor, textiles and bedding. It is available at a variety of North American retailers including Amazon, QVC and Lowe’s. The Scott brothers are hosts of multiple top-rated HGTV series including the Emmy-nominated Property Brothers, Brother vs. Brother and Property Brothers at Home, among others. Their shows are enjoyed by millions of viewers in over 150 countries and their books, Dream Home and It Takes Two: Our Story, are New York Times and Wall Street Journal best sellers. In 2017, the brothers were named Habitat Humanitarians, the highest recognition offered by Habitat for Humanity. For more information about Scott Living, please visit scottlivinghome.com. VP+C for The Michaels Companies, Inc.